Mighty No. 9 designer Keiji Inafune was deeply frank about his latest game’s development troubles on a stream meant to celebrate its launch. It’s not something you hear very often from typically quiet Japanese game developers. After a lengthy series of frustrating delays (and bizarre marketing), Mighty No. 9 launched today on most of the platforms promised by developer Comcept. 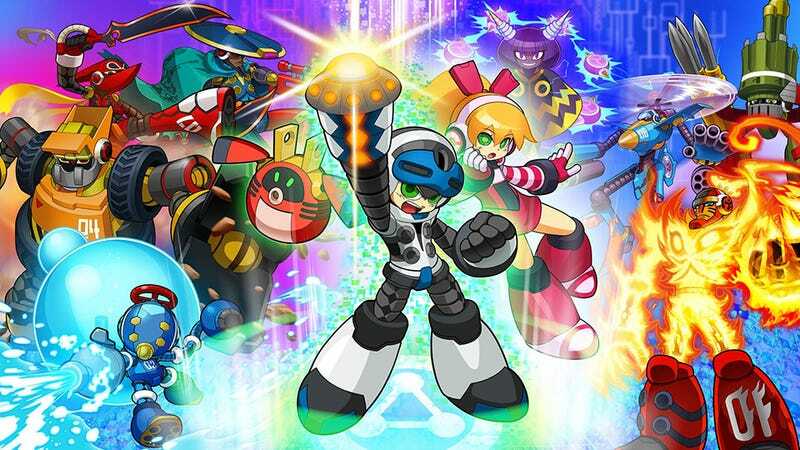 Pitched as a spiritual successor to Mega Man from ex-Capcom designer Keiji Inafune, the game was crowdfunded to the tune of nearly $4 million in 2013. As part of a lengthy stream celebrating the game’s launch, Inafune was joined by Ben Judd, who previously worked as a producer at Capcom with Inafune. These days, Judd runs Digital Development Management, a company focused agency, consulting, and production services. Judd was translating for Inafune, in addition to providing his own observations and commentary. Judd’s translations are mixed with his own commentary. Keep that in mind, as it can be a little confusing to follow when he’s switching between both voices. When you do the Kickstarter campaign, a lot of people don’t realize this, they see the big number—we’ve talked about this before—but they see a number like four million and they expect that’s the actual budget. And on every single website and every single user forum, that was the number that people would say...heck, people are having a little fun with us and mentioning it in the chat, as well. The reality is that it’s 60% of that. At the end of the day, at the end of a Kickstarter name, don’t look at the final number. Imagine that being 60%. But in order to increase the content in a wide variety of ways—stretch goals are largely going to be based around new platforms, etc— you really need to be able to estimate the amount of financial burden that’s going to occur on the project. Even for someone like him [Inafune], who’s worked on so many different games, it’s a really hard thing to estimate. It’s something to keep in mind with Kickstarters. So game development is a huge challenge, it’s emotionally trying. [...] It’s the kindness, it’s the supportive comments that really keep people going. Because at the end of the day, we’re just people and we just want to make a good game. It’s that sort of kindness he really appreciates. I [Ben Judd] know that when I made a game, as well, and I would go home and cry myself to sleep because it was so mentally...just destroying me. Having those comments were great. You can watch the stream here. The interesting bits start around 48 minutes in.